Age, complexion, character. Clothing should emphasize the inner dignity of man and his external data. Only appropriate clothing to feel comfortable, to be confident. Create convenient and beautiful clothes is the goal of the simulation. In modeling first of all it is necessary to consider that the shape of the garment depends on the shape of the human body, age, appearance, character. Equally important is labour, and the environment. You need to take into account the aesthetic requirements of the society in which he lives and works. The shape and proportions of individual body parts is particularly important. Depends on the choice of product form, silhouette and even color. Clothing should emphasize dignity of the figure and to hide, to mask its shortcomings the correct selection of the cut lines. It must comply with the rules of hygiene, to be practical and comfortable. The change in uniforms depending on the age is dictated by the appearance changes of a person throughout his life. Every age has its distinctive features. For young girls (18-20 years) is characterized by the femininity of a young appearance, lightness and mobility, so depending on mods made to emphasize the hips, waist, chest. The sportiness and ease of cutting, and emphasize age. Thirties woman recommended special care in the design of the toilet. You can wear the latest trend clothes, bold in form, colour and decoration. Much attention is paid to the hairstyle and shoes. In forty years, the suit serves as a backdrop for the manifestation of personality and intelligence. By this time, the woman has a certain, well-established attitude toward the world. The clothes she picks don't last shout of fashion, and therefore to his type of physique and the position that occupies in the family and society. Simplicity and practicality combined with elegance are the most typical traits that are apparent in fashion choices. About a woman can say that she has found her own style. In modeling clothing is necessary to consider not only the appearance of a person but also his character. People by their nature are very different. Some calm, balanced, restrained, modest, romantic. Others have opposite traits. These internal features often play a crucial role in the choice of shapes and colors of clothes. Attempts to identify the relationship between physique, temperament and character allowed conditionally divided into five types of women: young, athletic, feminine, elegant and phlegmatic. Women, youth type, regardless of age more angular and choppy in his movements, pulled. Excitable nature, outgoing, choleric type. These women are impatient in fashion devoid of moderation. If they don't have good taste, they risk looking gaudy, spontaneously. They can recommend clothes classical and sports-business style in which they will always be attractive. The biggest danger to women, youth type lurks in paints. Of course, in accordance with his temperament, a woman can use bright saturated colors, but picking up the tone, it needs to consider age. If a woman is over 30, then, choosing as the main striking rich color, extra need to choose achromatic (grey, white, black). Feminine women are soft and smooth movements, balanced, moderately coquettish. The shoulders are narrow, sloping, thighs wide. The fullness of moderate or more significant. Temperament rather phlegmatic than sanguine. In most cases they are dressed casually or go out of fashion. A woman dressed well, it should be actively encouraged. And when she starts to dress in accordance with his individuality, with great taste, it will be beneficial for her appearance and mood. This type of women should look for your style feminine-elegant character. Women elegant type characterized by a strong, balanced character (sanguine), precision, calm and confident demeanor and move. Women of this type of toned, slender and of moderate fullness. Fashion perceive is most active, not linked to the old, demand change, inclined to elegance and refinement. Such women can safely wear dresses sophisticated designs with an eye to detail of finishes and add-ons. Phlegmatic type is characterized by very stout women of average and below average growth. The whole figure is as if they have lowered, movements are soft, flowing, lazy. In temperament they are phlegmatic or melancholic, the most difficult subject to fashion. Sharp paint do not correspond to their nature, but that does not mean that they should wear only gray clothes. Beautiful fashion clothes can have on a woman healing effect. These groups do not cover the entire diversity of images of women. Possible variations of the mixing of types. Occupation. The form of the clothes also depends on the nature of its activities. Work in office, factory, plant, school, Institute, sports, and tourism require appropriate clothing. No matter how good the costume for theatre, not wearing it at home, in the home. No matter how comfortable and no colourful dress for summer rest on the sea, no one is going to work in a state institution or factory, etc. for Each specific setting should match the clothing of certain forms. Clothing service where a person spends most of the day, deserves no less attention than, say, clothing for theater, festival, etc. Of course, the costumes for the service (Fig. 5) should be comfortable and practical, to help people in work, to discipline. Decoration and details should be appropriate in a business setting. However, casual suits depending on the professional activities must have various forms. The people of some professions may require more dressy clothing, such as journalist, actor, commentator or TV presenter etc. For working at the bench, for the construction of the most appropriate jumpsuit. Casual wear can be very diverse.It should also be modern but not trendy. The sets, costumes and dresses casual destination for a long time will remain modern, if to avoid too Intrusive details, finishes that quickly bored. Colors to choose calm, in harmony with the business environment. In recent years, the large spread of business. 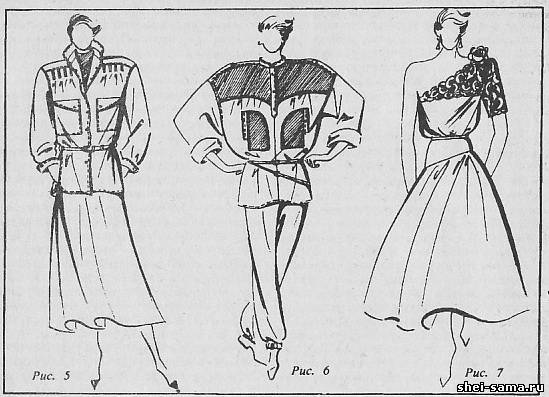 Modern set may consist of skirts, blouses, vest with jacket, blouson or jacket, dress jacket, dress with blouse and etc. Almost all casual clothing is solved in sporty style. Classic dresses and suits depending on the add-ons can change your character. Severe forms of blouse will give the classic suit a business look, romantic - make it elegant. The choice of fabric for everyday clothes depends on season, type of clothing, the nature of work and the entire surrounding environment. Materials better to select a practical, good holding shape, does not crease, does not require a lot of worries. Details of everyday products - classic and sporty. Finish simple nemnogosloven: folds, edges white finishing removable parts, narrow and wide leather belt or just a decorative line. Leisure wear (Fig. 6) more free, liberated. Usually, it is solved in sets. To be set can be different, depending on situation and taste. Multi-product kits usually consist of these types of apparel like jackets, jacket-shirts and jackets-blazers, jackets, blouses and skirts and of course pants. In youth kit can include jumpsuit and hat. Depending on the time of year sets to rest a variety of fabrics, finishing and additions. If casual cool and distant, leisure wear more bright, colorful, emotional. Its design uses the technique of combination of materials, often contrasting color. Sport style leisure wear dictates a variety of parts: yoke, shoulder straps, a sophisticated patch pockets. Trim should emphasize the ease and beauty of this kind of dress: the clasp on the buttons, buckles, embroidered emblems, inscriptions-the characters on the theme of sport. Dressy clothing is designed to beautify man. It should answer its purpose, setting, help create a good festive mood. Elegant dress (Fig. 7) or set as a decoration of the human, more than any other types of clothing must fit the individual features of appearance and character, demeanor. In fancy dress the seasonality is less important. The effect of season effect in the material, finish, necessary additions to the toilet. Details elegant clothes should not be practical.Various kinds of draping, kokila, scarves, ruffles, embroidery are usually just decoration. Fabric can be a variety of raw materials, formulation, color, pattern, but not everyday. They also have to decorate. You must remember that every suit is good only if it meets the environment. Good taste is manifested in the ability to dress always appropriate.